Let us introduce ourselves, all the team at PETROFER UK, scroll down to meet us all individually. We pride ourselves on our knowledge, customer focus and care. As a team we are the local face of a global organisation and can offer the following services from our Telford offices: sales, technical support, on-site service, problem solving, sampling, laboratory analysis and transport. Every one of us is available by telephone or e-mail and we are all looking forward to coming to your site. 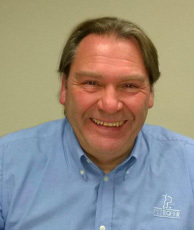 Hi, I am Stuart Gregory, the Managing Director of Petrofer UK and also a member of the Global Executive Committee. I started life as a Trainee Apprentice/Metallurgist with GKN then moved to become a Research Technician at Sheffield University, and following obtaining Engineering qualifications moved back into industry. First working as a Production Engineer, gradually moving to Production Manager. Following the company closure I moved into selling industrial process fluids as Technical Sales Manager with an Australian company. Some 21 years ago I moved to Petrofer UK working through Technical sales management and becoming MD over 4 years ago. Away from work I enjoy Rock music, motorcycling and charity work with NABD and The Chernobyl Children’s Project. Most sports, though, particularly with a ball, count me out and just pass the red wine over! Before joining Petrofer UK Plc in April 2018 as UK Sales Manager, I worked in both the precision Engineering and Lubrication industries. I began my career as an apprentice machine tool engineer for TS Harrison & sons in Yorkshire. I then moved into Sales in the mid 90’s where I worked for a large German multinational company afterwards taking up the challenge of running my own company. I am looking forward to the challenge of building on Petrofer’s long established recognition as a technological leader for lubrication solutions. Music is my passion and I play the keyboard and also DJ. I can usually be found on the weekend playing some classic vinyl records on my “wheels of steel”. I joined Petrofer in 1994 originally working in the Telford Laboratory. My role with the company changed in 1997 when I joined the technical sales team. Over the years I have been fortunate to have being involved in nearly all of the manufacturing sectors where our products are utilised. In particular, I have gained a wealth of experience in heat treatment processes, metal working and parts cleaning and have a sound knowledge of the Petrofer products ideally suited for these applications. In my spare time, I enjoy traveling around the UK with my family in our battered old motorhome and also going to music concerts and festivals. Hello, my name is Charlie and I currently work as a Technical Sales Engineer for the south, I recently joined the company in 2019. Before joining Petrofer UK PLC, I worked for a large International Oil & Gas Company as a Mechanical Test Technician. During this time, I completed a 4-year advanced Apprenticeship and HNC qualification in Mechanical Engineering. Outside of work I enjoy playing rugby for my local team, which also closely includes my second favourite thing drinking beer. I joined Petrofer in 1993 having previously worked in the UK Industrial oils and chemicals industry for more than 15 years. I am now the longest serving employee at Petrofer UK and my commercial role includes managing our internal sales and stock inventory. I joined Petrofer UK in July 2012, following a career predominately within the financial services sector. I have settled happily into my role at Petrofer and enjoy being part of a small, but highly efficient sales team. My day-to-day responsibilities include ensuring customers’ sales requirements are processed and despatched in a timely manner, in addition to various other office administration duties. I’ve been working at Petrofer since 2002 where I started off working for 10 years in the laboratory. More recently I have moved to the position of Accounts Administrator where I spend my time doing day to day accounts, budgeting, excel analysis and working with suppliers. I started with Petrofer working in the Technical Service Laboratory in July 1997, having worked in Industrial Oils and Chemicals for the previous 19 years. I currently have the role of Laboratory Manager since the expansion of the Laboratory in 2002. As well as overall running of the laboratory and the training/supervision of laboratory staff, I carry out routine sample analyses/reporting and also help provide cover for the Warehouse. In addition I co-ordinate the quality system and am a point of referral for technical matters. I started working for Petrofer in 2013. I work in the Lab and the warehouse. I became an employee with Petrofer UK since 1998. Having assisted Petrofer for a number of years prior to then. I work as many hours as the law permits to deliver our customer requirements. I also have responsibilities within the warehouse with booking in of shipments from Germany. I started working for Petrofer at the end of 2001 after 11 years working for one of Petrofer’s customers. I’m from a maintenance background and am also a time served toolmaker after working through a 4-year apprenticeship. My role in the company is service engineer for the North and Scottish customers and also part of the Petrofer Paper Chemicals division in a technical sales role. I have been a member of Petrofer UK since March 2010, previous to that I worked as a technician in a motor main dealers. As a service engineer I look after in use fluids and equipment, and assist in the running of trials. I am based in Telford and cover the Midlands, the South and Wales. I’m a service engineer and have been with the company since November 2009, although I have been in the industry since May 1997. My duties are fluid management and machine services for a major car components manufacturing company based in West Midlands. My interests outside work would be old school BMX, Geocaching and football (watching not participating).